Well, whether or not I can comprehend it, my season ended 2.5 weeks ago. If you follow my posts at all, it was a questionable start, after getting an ankle joint infection from a cut from climbing, that required surgery and 3 weeks on the couch. I fought back more slowly from that than I had anticipated, with 5 weeks of antibiotics and a few weeks of doing nothing taking their toll on me more than I would have liked. But about 3 weeks later all of that had faded into the background of being immersed in the life of running our ski touring business. It's a routine that makes the days fly by. 5:30am wake up to do the weather, chop would, prep breakfast and lunch, guide's meetings, help guests with gear issues, and finally get out the door to ski at 8:30. That's when the day gets simpler, lodge maintenance fades into the background, and the purity of one step forward at a time and snow assessment take hold. 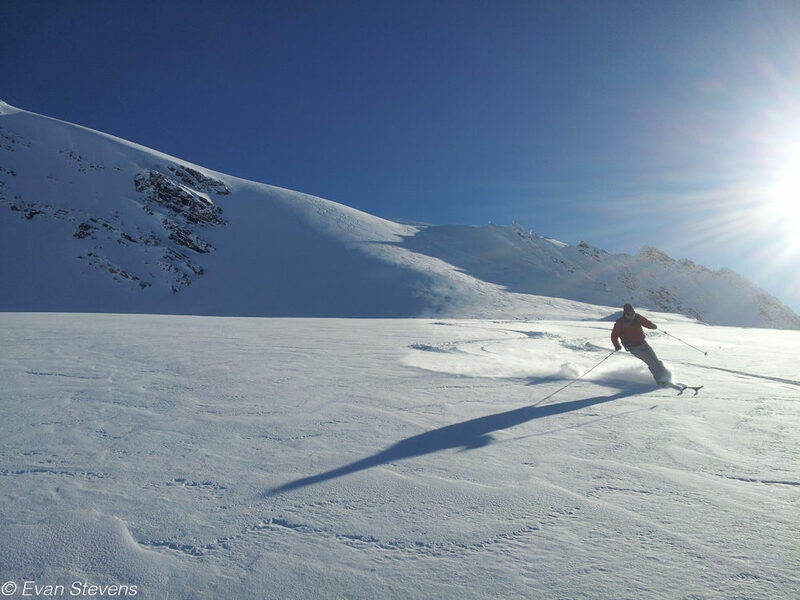 Your skis grant you the freedom to escape from the grind, whether you are a guest on holiday or a guide/owner/operator for a day at work. We all lose ourselves in the moment of striding uphill and flying downhill, from valley to mountain top and back again. Smooth and fast we slide back to the lodge, the tasks take hold for me again, with a mirror image of the morning routine, but its great to watch the guests stay in that zone, melting away in the sauna, replenishing the burned calories and continuing with the simple life. But then my world decided to change. Just when you are hitting your stride, sometimes the world has a different path for you to follow. 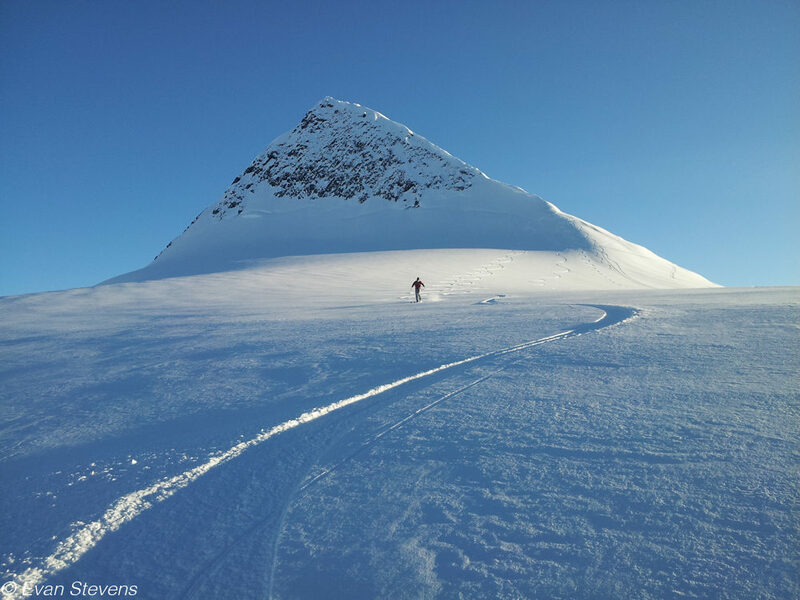 I had just finished a big week of guiding, with a group of guests, we averaged between 8 and 9 thousand feet of skiing a day, a few people squeaking in 50 grand for their week. 6 weeks after having surgery I was worried if I would pull it off, but hard and tiring as it was, it was also rewarding, considering as well that we had uncharacteristically bad snow for a bunch of days from an abnormal wind event that seemed to jack every bit of open snow in British Columbia. The next group came in and a few days later so did the snow. 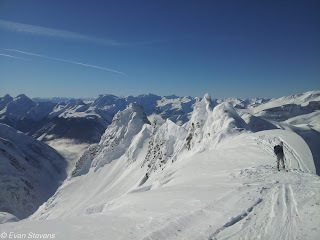 We settled in to the 'normal' 5 to 6 grand of skiing per day, which is plenty by my standards, and with 30cms of fresh snow, it felt like a new world out there. So I was skiing like it was bottomless Kootenay cold smoke, but then I hit bottom. Or at least started my journey to the bottom. 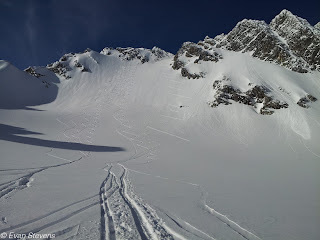 In my typical, 'I want to ski to inspire' fast and fun style, I found the wind jacked snow just below the surface, and my left ski decided to auger in and go a little to the right while my body kept going straight and maybe a little to the left. Then I heard the 'pop' you hear about and fear as a skier/athlete/guide. I instantly knew something was wrong. As is human instinct I tried to get up and walk it off, but boom, I was right back on the ground, my left leg no't working right. 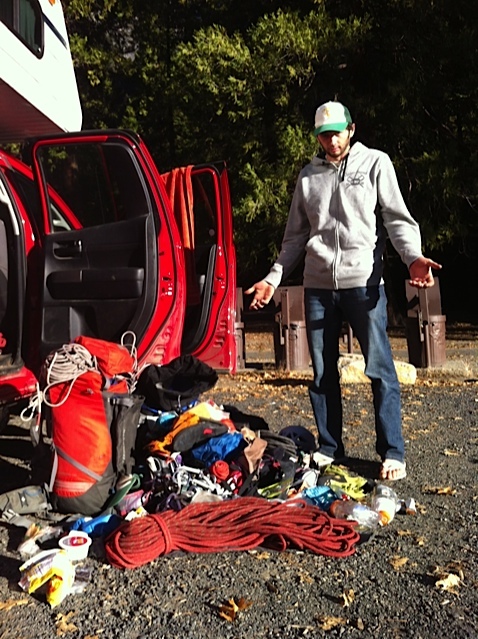 Deep in the backcountry, I looked at my watch and started to make decisions. I still was with a group of 12 guests and 2 other guides, so support was there, but that was the rest of everyone's day, dealing with me. A few super labored zig zag turns and collapses and I made it off of avalanche terrain and met up with the group, almost blacking out with pain and adrenaline. With cloud building and a quality rescue sled made by Kootenay Rescue Bubble, Jasmin, my super tough wife and co-guide, made the right call to drag me out. So we immobilized my leg, put me in the sled and spent the next 3 hours getting me back to the lodge. It took 100% from everyone to make it happen, team work at its finest but for sure Andrew (the other guide) and Jasmin worked the hardest. Getting back to my cabin at the lodge is when it all broke down. Waves of emotion crested over me as I knew my path had changed. There will be no freedom in the hills for many months now, my endorphin source taken away. A new uphill battle through the 'non-life threatening' public health care system was setting up to be my fight. I wasn't scared or upset at hurting my self, and looking at surgery and the road to recovery, I was more upset about letting down my wife, having doubled her workload at our lodge with me out of commission, scared at losing my freedom and becoming a prisoner of immobility, scared of losing touch with my wife and hound as I knew I wouldn't be able to be up at the lodge for the rest of the winter as I battled down the road of recovery. The preciousness of the special and unique life we have seemed all to real. We all adapt and change though, and we settle in to our new roles as best we can. Or maybe we just cope. Again and again, folks like to talk about the 'reasons' behind things happening. I don't think things happen for a reason. I think we are all in control of our destinies. I think the 'silver lining' is something we find on our own and decide to focus on. One door closing just makes you realize that there are other doors to open and explore. I found my path and partner in life and I am going to fight like hell to get back on it and with her stronger than before. Eventually I will get in to surgery to repair my ACL and meniscus and my bruised up bones will heal. Maybe I will learn some cool things along the way, or maybe I will realize that in my mid 30s I need to stop breezing through my physical life and start making my body work harder for it and training. Either way my eyes are open to what needs to get done and now I need to do it! So you won't find the deepest faceshot, most majestic views or insane physical feats coming from me for a few months. You will find me filling you in on the slow road to recovery that I know many of you have traveled down, with the small victories and defeats of the daily struggle. I know a ton of you can relate, and my strength comes from standing on the shoulders of so many of you that have hurt yourselves before me. In the end, no one died, and I should be charging in the hills again before I know it, so really its just a flat tire, with a busted spare, and a long walk to the nearest service station for help. And when I get the tire fixed I can continue down my wonderful path in life! PS...thanks to all the friends and family that have showed their support, much appreciated! We're back! Lodge is renovated, ankle is healing, snow is deep and stable. Bring it on! It was 830am and I was totally destroyed physically and mentally. 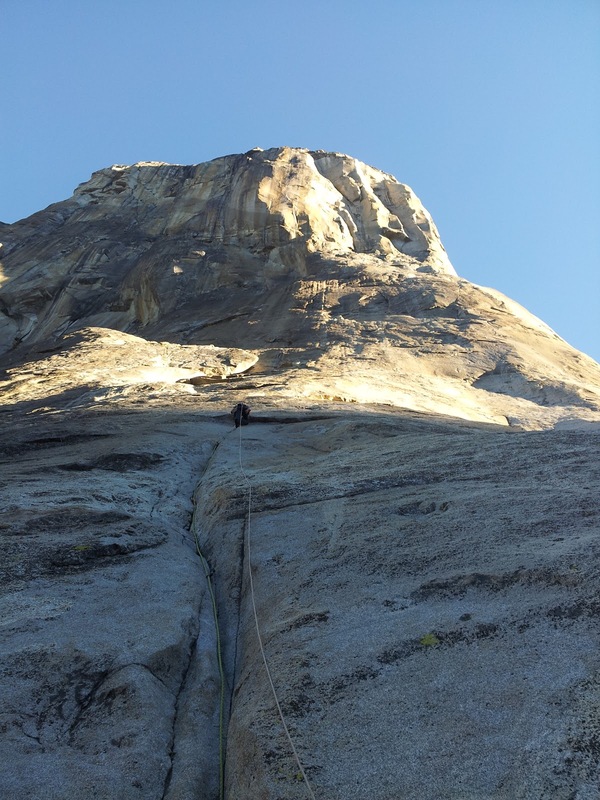 We had been climbing since 3am to beat the way too hot November sun and I just finished pitch 28 of Free Rider, a 34 pitch free route up El Capitan’s south west face. It was the last 5.12 pitch on the route, but that didn’t mean much. Up next was a steep 5.11, followed by an 11d finger crack which led into the notorious Scotty Burke off width, with another 2 5.11- pitches and a gimme 5.6 to the top. Graded 10d, the Scotty Burke might be the biggest sandbag I have ever experienced. It took me 4 tries to figure out how to climb it on toprope, and when I got it, I was really fresh and rested. When I got to it on this day it would be on my fourth day of climbing in a row, after sleeping on the wall for 3 nights. ‘Sleeping’ would be an overstatement. It was more like a few hours of napping over 4 days. Everything was taking its toll, and it all caught up right now. Only 31 more pitches to go! 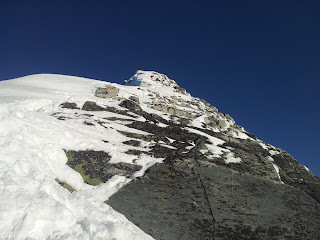 Right now was sitting on the Round Table Ledge, after completing a wild 5.12 traverse on the lip of the Salathe Headwall. To give you an idea of this position, imagine yourself doing a hand traverse on top of the empire state building…which is sitting on top of another empire state building. Ya, it’s that exposed. I was sleep deprived, bonking and exhausted. I screamed, battled and hung on with every last bit of juice I could muster up, as I had climbed every pitch with out falling to this point, and I didn’t want to start failing now. Somehow I made it to the ledge, but that was pretty much the end of me. I managed to set up the belay, haul over our day pack, and get Jasmin to start following. She was sending the route to here as well, and I wasn’t about to give up on her yet. Pitch twenty something, the block. What she found when she got to the belay was a shattered remnant of her husband and climbing partner. When you climb with your wife, there is no buffer or toughness on the surface that you might have with your friends, and before I knew it, I was crying. Granted, I cry more than most guys, I am a bit of a sensitive softie, but I had just sent the pitch, I was sending to here, yet I felt like I was about to fail. Years of dreaming about climbing this route, weeks of training and prep to get to this point in time and space, and I was crying, ready to throw in the towel. But that is what makes climbing so special; it’s a partner/team sport. When you can’t make it happen, sometimes your partner steps up. Jas took the reigns and shoved food and water down my throat, lots of food and water. 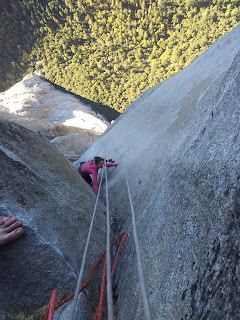 A half hour later, while belaying her on an ‘easy’ 5.11 pitch, I started to come back to life. Calories, caffeine and H2O were going to my failing muscles, slowly rejuvenating them. The Monster! Hateful 7" crack. All I had to do was make it through the next two pitches, and the last 3 I could do no matter what. With no excess of power and strength, it all came down to technique and mental fortitude. That is what you should be doing anyway, but I guess there are lots of times when I climb ‘dumb’; pulling my self through moves and not climbing through them intelligently and efficiently. Well, there was no choice now. Chimneying, jamming and finding stances, I somehow rested my way up the 150’ of crack climbing to get to the steep and exposed belay for the Scotty Burke OW. I grabbed the handful of cams I thought I would use, leaving behind all excess weight. I climbed smart and fast through the steep 11d crack to the no hands rest before the 10d off width. I took a long break and slowed things down. I tried to remember all the techniques I had learned climbing the world feared/renowned Monster almost 1500’ below me. (The Monster is a 160’ 5.11 offwidth that repels/scares away a lot of climbers. I had onsighted it on the first day up the wall, after not really sleeping in anticipation of how hard it might be. Technique came through and somehow I waltzed it!). On top rope I had lay backed the hardest part of the Scotty Burke, but that was not going to happen today. I entered full grovel mode and dug in to the trench for 100 feet of full on warfare. Inch by inch I locked my heel-toe cams in, arm barred and crimped. No one could see me as you are around a roof, but everyone could hear me screaming away in the biggest battle of my climbing career. 100 feet to go to send El Cap…and on this day technique and mental fortitude prevailed. I had never dug so deep in my life. Getting up to the anchor with no more gear and slings, and sitting on the ledge in the sun, a wave of relaxation and contentment took over. Wow. Jasmin cruised the pitch behind me, and it was all but in the bag for both of us. 4 years ago we had tried to do the route and failed. We had spent 2 weeks before launching up from the ground checking out all of the pitches on rappel and top rope and we were still not sure if we could do it. But there we were, 3 pitches from the top, and we were doing it. We each made it possible for each other, coming through when the other couldn’t, and now we were enjoying success together. 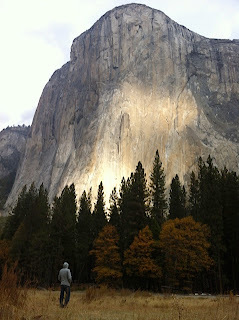 For 15 years I have been going to Yosemite, most of my climbing career. From my first hard multipitches (Astroman), my first multiday big wall (the nose, el cap), my first one day big wall (the nose) to the crown jewel of my climbing dreams (Free Rider), it has been my proving grounds, and fuel for inspiration and memories, and this journey would be no different. P.S. : Just so the truth is out there. There were 2 pitches that both of us tried to lead and failed, the Teflon Corner and the 2nd Endurance Corner. 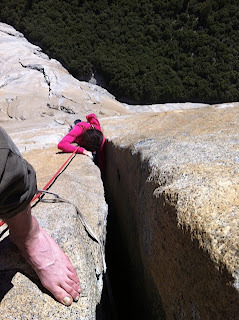 We both tried multiple times, and could not send them on lead, but both managed to top rope them clean on our ascent. I know its not a perfect ascent, but I climb for my self, and I couldn’t be happier with what we managed to do with the time and energy we had at our disposal. 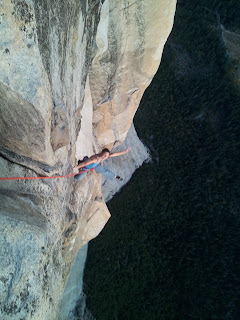 Free Rider, El Capitan, Grade VI, 5.12d, 34 pitches, 3,000’+. 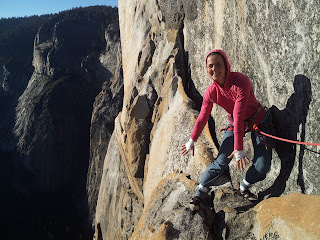 Climbed from November 1 to 6, 2012 with Jasmin Caton. The pow has been piling up. Lots of persistent weak layers right now in the snowpack, but that doesn't matter too much for endless powder skiing here at the lodge. A quick update, with some footage from the last 2 weeks. 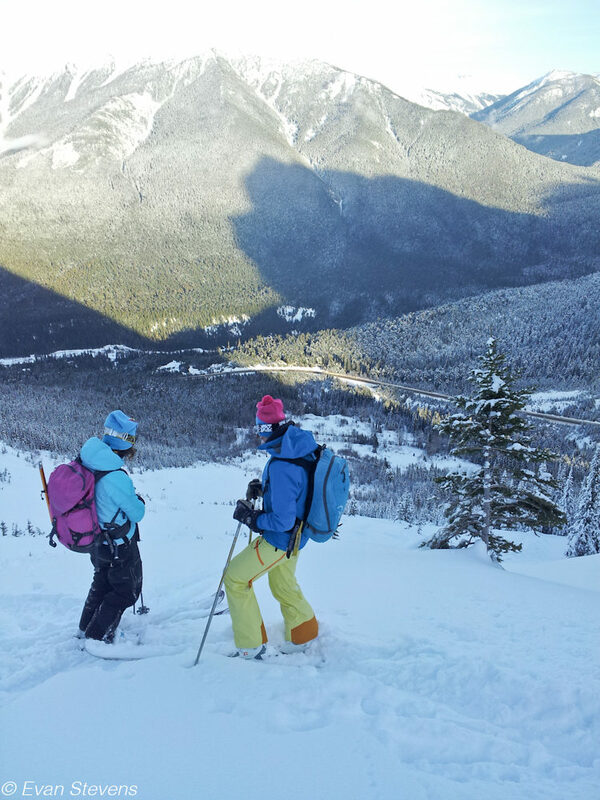 We went from bomber stability and high pressure, skiing new and seldom visited lines to hiding in the trees while it dumped 120cms of snow last week. Fun times regardless of the day that is for sure! Columbia. Well, usually it does and for most of January it sure did. 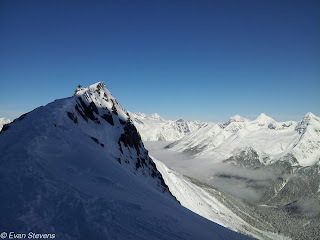 Alas, last week the snow hose shifted its focus, and squinty eyes and sun burned noses returned to the mountains of BC. 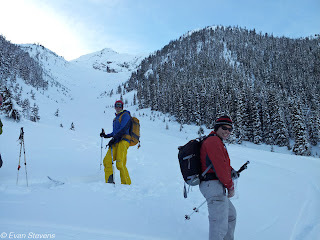 With my father in law, the original owner of my backcountry ski lodge Valhalla Mountain Touring, in place as the hut keeper, I knew I needed to get out of my neck of the woods and go play in the big peaks of Rogers Pass. A quick 2.5 hour drive from home (not including the snowmachine ride to my truck and the half-hour ferry ride inland), Rogers Pass is the number one place I go to play when I have some time off. If you haven't been, its time to change that, as it is host to some of the best road-accessed ski touring in the world, hands down. However, my "time off" didn't last very long, as a client of mine got in touch from snow starved Alta, Utah wanting to connect and ski in Rogers Pass as well. Being that I am a mountain guide for a living, I couldn't say no, especially since I know I can drop the hammer with Andrew (my client) and never lose him. 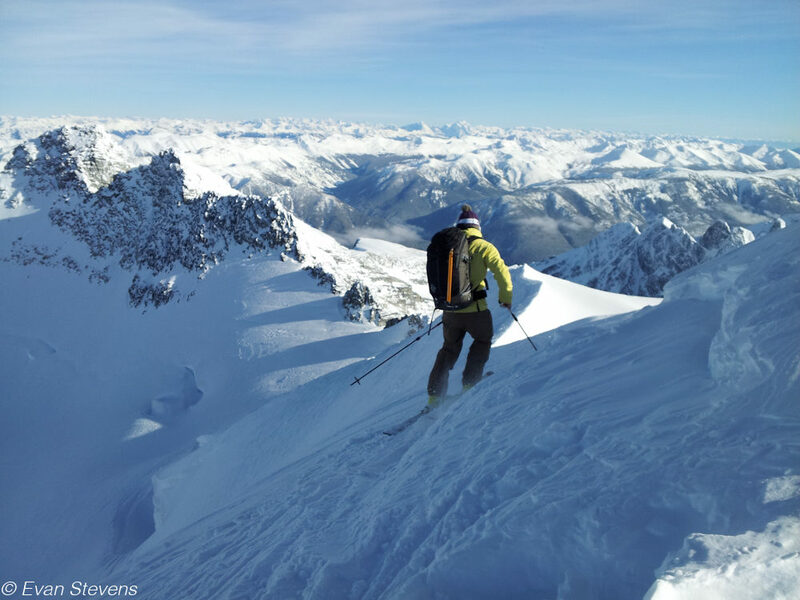 He has the luxury of retiring at an early age and ski touring out of his front door in Alta, and is notorious for skiing 7 to 8,000 vertical feet every day he heads out. 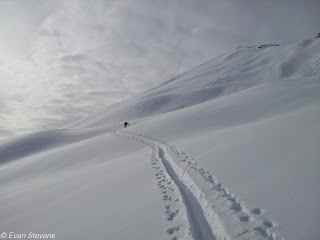 A day of work with him is like showing a good friend who is keen and fit a good time in the hills, with no compromising the objectives that I want to ski. But then again, my job is always about going out and showing great people a great time in the hills! We met for the first day of high pressure and skinned up at the front door of the Glacier Park Lodge, the lone hotel in the middle of the pass. For $100 a night, two people can share a room, with world-class ski touring everywhere you look. 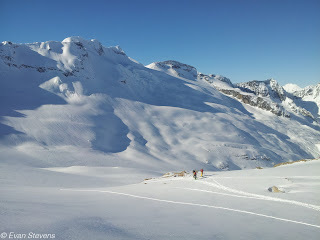 With temperatures still cool, 20 cms of fresh, non-wind affected snow everywhere and bomber stability, we set out to ski until we ran out of daylight. We headed up Video Peak first, one of the easiest access summits in the park, but still 4,300 feet of uphill to get the summit, and a 35 to 40 degree 1000-foot headwall that you must negotiate to tag the peak. I dug a quick pit to confirm what I knew about the snowpack: no persistent weak layers and no slab on with any storm snow weaknesses. Before we knew it, we were eating lunch on top and staring down a 2,000-foot run of perfect boot-top pow. It was so nice, we had to do it twice. We then busted over to the thigh-burning 2,500-foot 8812 bowl for a lap, and finally found a nice 1,000-foot treed pillow gully to take us home, 9,500 feet for the first day at the pass in the bag! With the warm, high pressure settling in, I knew we had to act on the second day to ski any solar aspects, as they were going to get cooked by the sun. This was a no-brainer for what objective to choose — Rogers Peak. 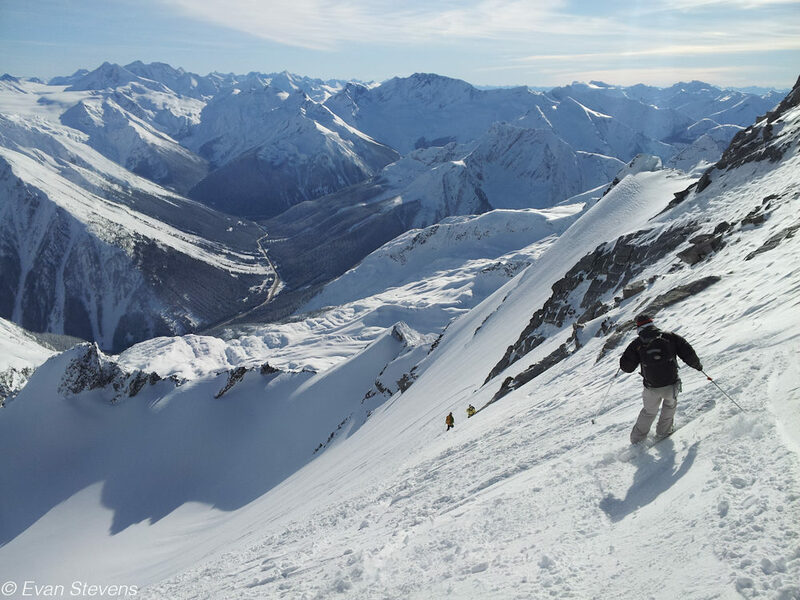 With 6,300 feet straight up from the highway to the summit in one push, and a 1000-foot, 45-degree headwall, it is in my mind one of the crown jewels of ski objectives in the pass. 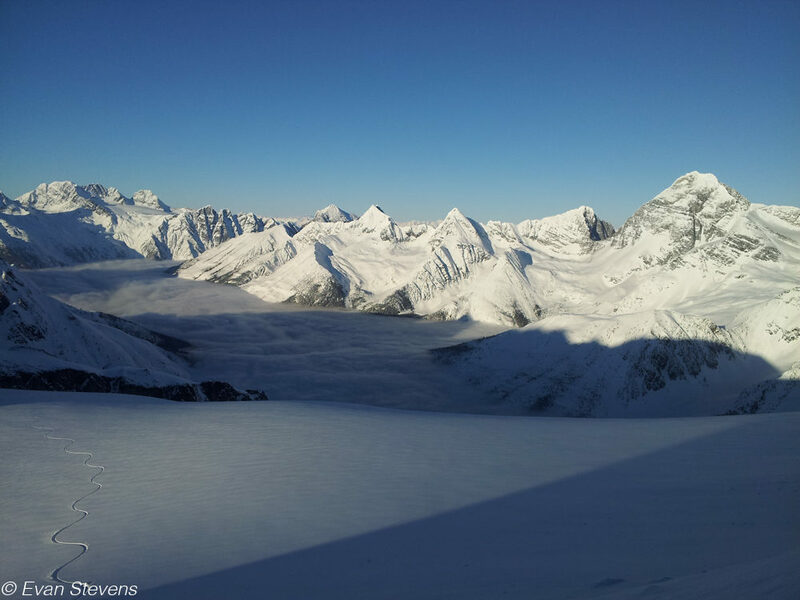 Glaciers, old growth, moraines, steepness, knife-edge summit ridge, this line has it all. For the icing on the cake, I decided we should link it into the Tupper Traverse, another uber classic of the pass, that involves skiing around the rock sentinel of Mt Tupper, and exiting via a 4,000-foot avalanche path down to the highway. Halfway through the day we caught up to some friends of mine, five to be exact, and we all spent the day together and I convinced them to ski out the Tupper as well. 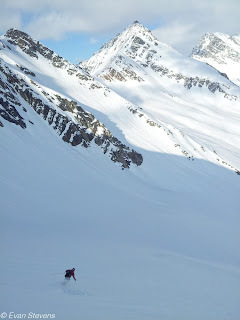 We cruised along, skied the headwall in amazing snow and enjoyed the epic long descent back to the car. All told, 7,800 feet of up and 8,500 feet of down. 2 grand behind us on the Tupper traverse exit. 2 grand in front of us on the tupper traverse exit. Day 3 and it was time to explore the other side of the highway for some shadier options. 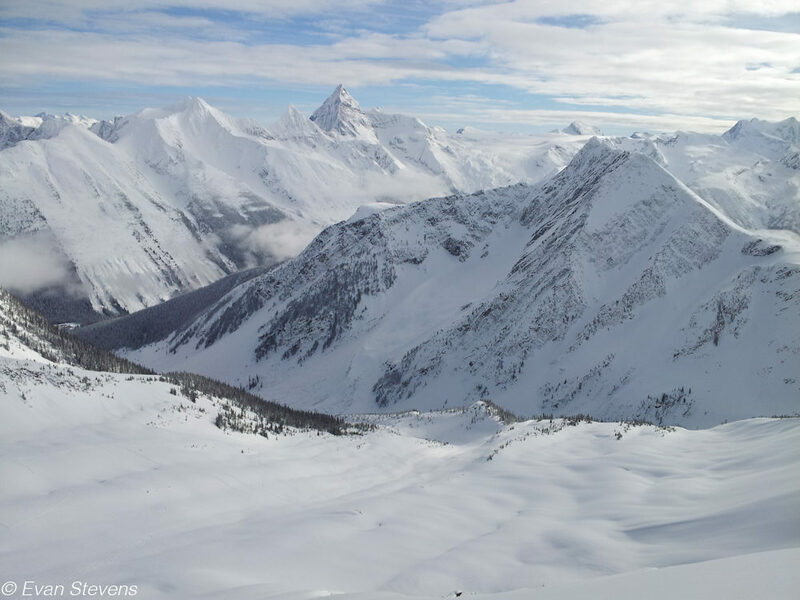 If Rogers is the crown jewel of the north side of the pass, then Young's Peak is the gem of the south side, with 5,500 feet of gain up to the summit via the famous run known as the '7 Steps of Paradise'. How can you go wrong with a run name like that? 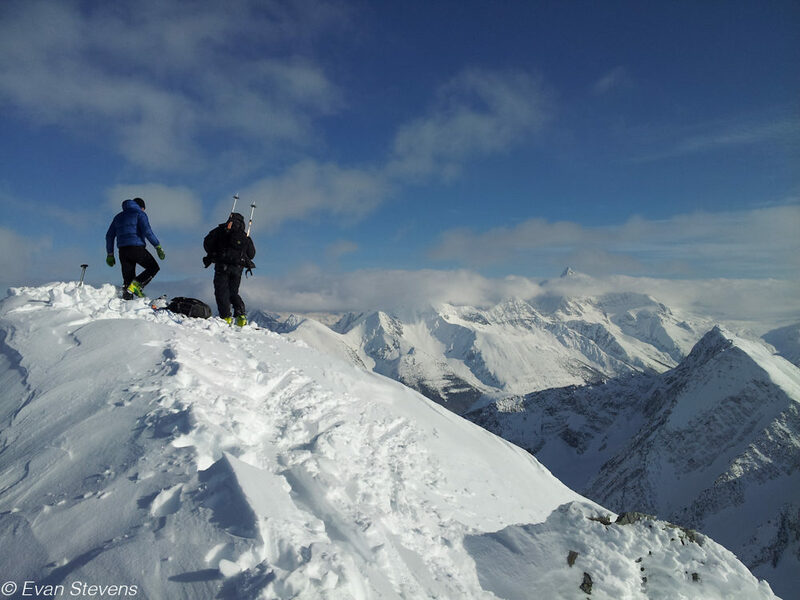 So once again we rocketed up, ate lunch on the summit and skied another epic glacier run of a few thousand feet to the valley bottom. Of course while on the summit we looked across the valley to another amazing summit and run, Castor Peak and the glacier below. So, with another 4,000 feet of uphill, we hit the peak and enjoyed another massive run in sweet snow back to the car, with another 9,500 feet in the bag for day 3. Day 4 came along and no one was tiring so I planned to bring Andrew up another new valley for him. This time we went up Loop Brook to the Lily Glacier and ascended 5,000 feet to the Dome and the summit of the Rampart. We did a few laps of the 2,000-foot glacier and then opted out of skiing down the Dome glacier, as we could see it was wall to wall tracks from the weekend traffic, and where we were had plenty of untouched lines. So once again, another huge powder run to end the day and 8,500 feet of skiing under our legs. 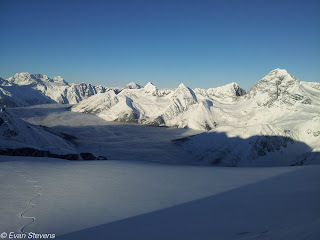 Our last day came, and the weather started to return to normal with no more inversion and some moderate winds in the alpine. The highways crew was targeting all of their new guns on the avalanche paths in the clear calm weather, so many zones of the park were shut down. We decided to return to the Video Peak area of Day 1, but put a few variations on the first day's theme. I was keen to ski a line I had done before, the north face of Video, but a little bit of slab from the winds, and a cold, dark look down the super committing 45-degree convex role to drop in, made me hesitate. Instead we took another run down in the powder on the SE face that we did on the first day, and went for a new summit, 8812. Wrapping around the back from Bruins pass, we entered a much more remote, glaciated basin, that no one had skied in yet. The summit is guarded by a short 50-degree headwall requiring a few minutes of boot packing. Five meters from the top, while booting up, I triggered a shallow hard slab that tried hard to wash me down the face, but luckily I was near the top and hung tight. Andrew was tucked behind a rock, safe and sound, so no worries there. I guess my instincts were right to not drop in on Video... I wouldn't have buried myself in a slide, but losing a ski that far away from home in the backcountry is not something you want to deal with. We clicked in and skied a beautiful line down the north glacier for 2,000 feet, climbed back up to Bruins pass and skied the last 4,000 feet back to the hotel and my commute back to Valhalla Mountain Touring. In five days we skied a tally of runs that has taken me a bunch of years to accumulate. 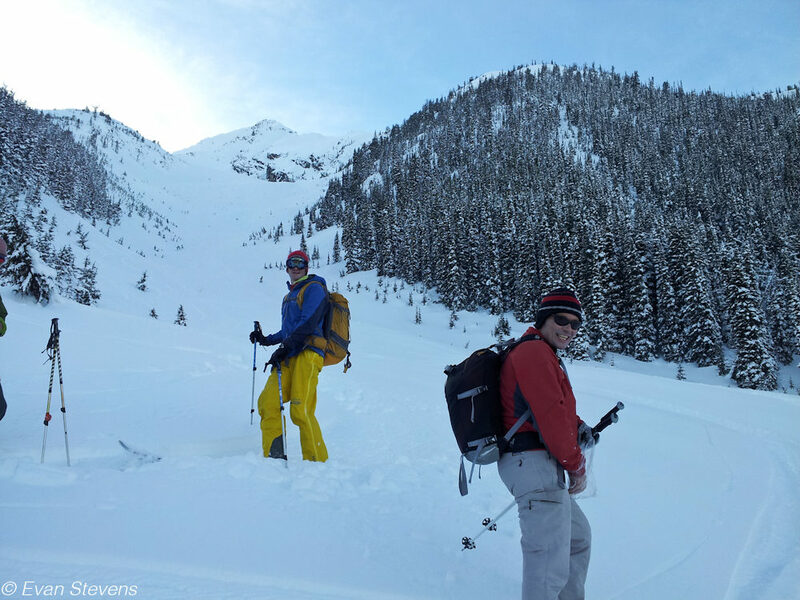 Timing and partners is everything in the mountains, and Andrew and I managed to put it together for an unbelievable ski trip to Rogers Pass. Good times keep rolling, 2-2.5 meter snowpack at treeline, and setting up nicely! 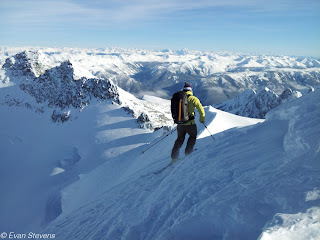 IFMGA Mountain Guide, climber and skier, always on the go for good rock and great snow! Email me to book an Alpine, Rock or Ski Adventure anywhere in the world!